The video of the father’s punishment has garnered over 15m views on Facebook and thousands of comments. 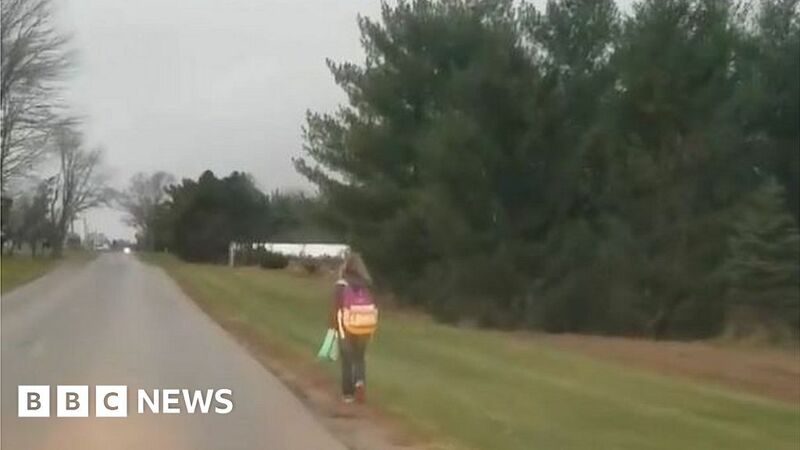 In the viral clip, Mr Cox’s daughter is seen walking alongside a road, carrying a backpack and school supplies, in 2C (36F) temperatures. “I know a lot of you parents are not going to agree with this and that’s alright,” he says. According to WTVG News, Mr Cox broke up Kirsten’s walk over her three-day school bus suspension this week. “As the grandparent of an autistic boy who has been the victim of neighbourhood bullies, I applaud you! Too many parents do nothing,” read one reply. “Humiliate her by putting her on Facebook being punished. Irony,” one user commented. “Ok but wait, is she bullying other kids or did you stop to hear her explanation?” said another. Mr Cox told News 5 Cleveland that he had shown Kirsten and his two other children the video and people’s comments on it. They “seem to show a great deal of empathy towards some of the sad stories that I read with them,” Mr Cox said. He added that he hoped parents would “start holding their kids accountable”.